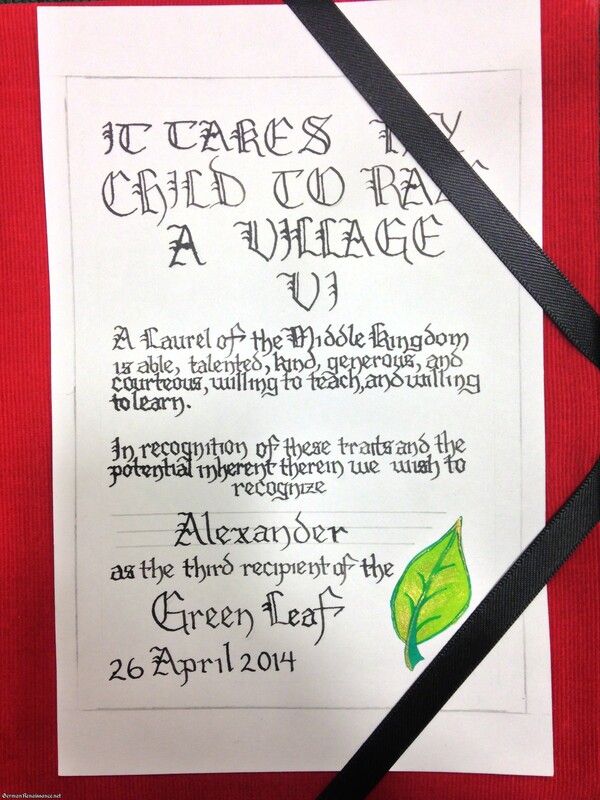 My son Alexander (9) is a very creative kid who really enjoys the arts and sciences aspect of the SCA. He adores teaching, but also likes making things for A&S displays. 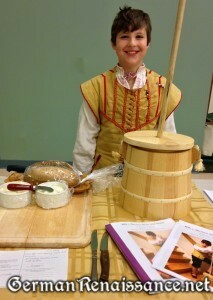 Last year he displayed his wax candle clock at It Takes My Child to Raze a Village and became the Youth A&S Champion. That sparked him to ask about entering the competition that I do, namely the Middle Kingdom Regional and Kingdom A&S Competitions. A little research revealed that youth could indeed enter, so off he went to consider his options. Originally Alexander wanted to make another type of clock, but we determined the skills needed were a bit beyond his abilities at this time. He then switched to dishes he could make (he loves to cook) and began researching 16th century German cookbooks. He found a recipe for “snow” (a sweetened, diluted whipped cream) online, and since he was going to make that, why not make butter too? 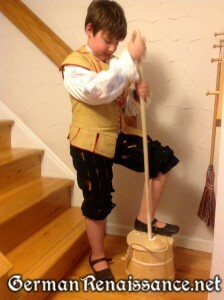 And that was that … he experimented with ways to make butter (shaking/churning) and together he and Gregor made a wooden dasher (plunger) for an existing wooden bucket we had. He’s made a LOT of butter (unsalted and honey). He entered his butter at It Takes My Child to Raze a Village again this year and became the Youth A&S Champion again, as well as the recipient of the Green Leaf (an A&S award that recognizes potential in young artisans). 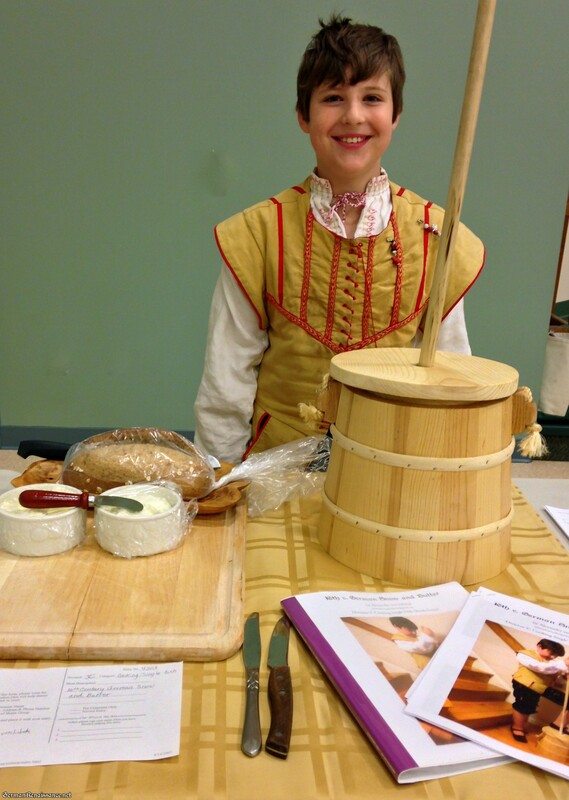 Alexander did very well at both Regional and Kingdom A&S — he made improvements in between (i.e., he tried churning his butter for a longer period to see what would happen) and gained proficiency in presenting his project to his adult judges. Youth do not receive scores or awards, but that did not distract nor deter him. Alexander, and many children like him, just want to be taken seriously by adults despite the fact that their skills are developing. Isn’t that true of all of us, really? I’m very grateful that we have this avenue of expression for him, and grateful for his judges — you were thoughtful and encouraging while still offering him real feedback. Let your child make want they want, within their skill levels, even if you don’t think it will garner rave reviews from judges — your child needs ownership of their project and they will learn from the judge’s comments. Encourage your child to do most, if not all, of the tasks associated with their project within their skill levels. Alexander helped make his tools, went shopping with me, did all his own churning, wrote the meat of his documentation (see below — I did not correct his mistakes), and most of the cleaning (though admittedly I cleaned the bucket because it was usually past his bedtime by the time he’d finished churning). Let your child do the talking to their judges. At regional, I simply sat in a chair behind Alexander and provided proximity support without any talking — your child may not even need this. At Kingdom, I came and went. I think it’s important they present their project to their judges themselves, as this is a big aspect of the competition. Stress the value of setting a goal and entering the competition, rather than winning an award. 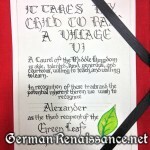 Alexander did get a certificate, but mostly I think he just liked hearing his name called in court and being RECOGNIZED. If you have questions about a youth entry in a Midrealm A&S competition, feel free to contact us! Alexander’s A&S Documentation for Butter and Snow (click the link to view the actual PDF or read the text of it below). this butter is made by a butter churn. this is how the butter churn works. there is a stick then 2 planks in a x shape with holes on the stick and its in a bucket. you pull it up and down. (for 30 mins). butter is simple to make, you can make yourself with cream and shake’n. snow is the german translation for slightly wipped cream. you put cream in a bowl with a little water (4 parts cream to 1 part water) and stir with a eggbeater. put on bread then sprinkle with sugar. Who Would Have Eaten It? The Welser were members of the mercantile patriciate of Augsburg, international mercantile bankers and venture capitalists on a par with the Fugger and the Hochstetter. The manuscript was edited by Hugo Stopp and published as Das Kochbuch der Sabina Welserin. (Heidelberg: Carl Winter Universitätsverlag) 1980. It is one of a very few primary sources for the history of German cuisine. Dilute cream and put it in a pot. And take an eggbeater and stir it thoroughly, until it forms snowy foam on top. And toast a Semmel (bread roll) and lay it in a bowl and sprinkle sugar over it and put the foam on the bread, then it is ready. daraúff ain zúcker vnnd thú den schom aúff das brot, so jst es berait. I saw Alexander’s entry at Kingdom A&S, while he was demoing it to the judges. He did quite well!